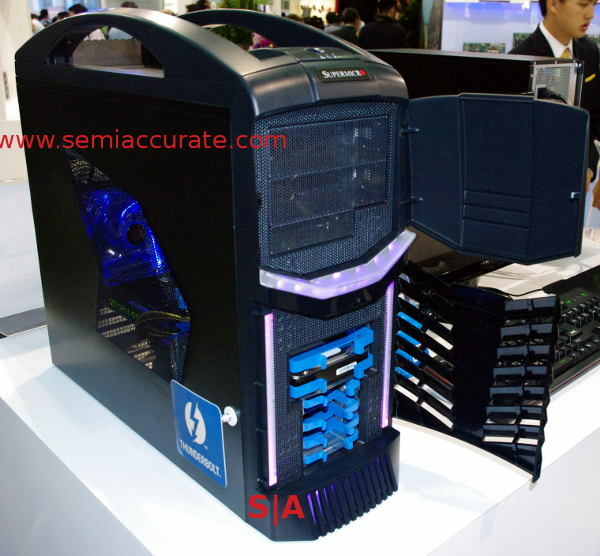 SuperMicro had three new chassis at Computex, two servers and a workstation. Several other products had updates with the 10GbE switches being the most interesting. 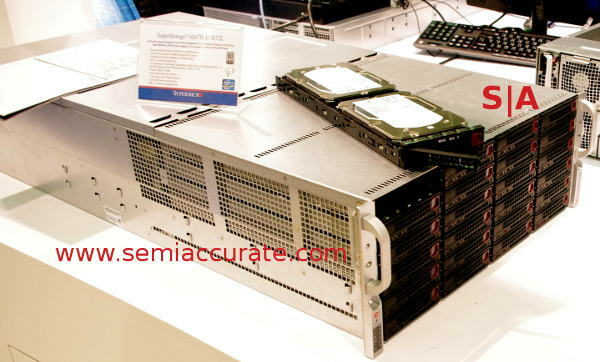 The first new server from SuperMicro is called the 6047R-E1R72L and as the name makes obvious, it is a dual socket Romley based storage server. This one stands out because of the drive configuration, it packs 72 3.5″ HDDs in to a single 4U box through very clever packaging. The key to this packaging is hot plug drive trays with two drives rather than one in each. There are 24 of these bays in front, 12 more in back with the mobo on top of them. Stuffed with 4TB drives that would mean 288TB in a single box. These drives are fed via an LSI SAS6 card or SATA6, your choice but you would be pretty silly not to go SAS for data protection reasons with this much storage. The box can take 512GB of DDR3/1600, has 4 PCIe3 8x slots for low profile cards, and has two more 2.5″ bays on the interior for boot or OS drives. Out the back there are four GbE ports and a full IPMI 2.0 KVM on a dedicated port. To spin up all the disks the box has dual 2000W PSUs which should be enough for most users. Next we have the SuperMicro MicroCloud servers, they come in both Intel and AMD CPU flavors. This one packs a dozen 1S server blades in to a 3U chassis with four DIMMs and either two 3.5″ or four 2.5″ HDDs behind them. The most interesting bit is that everything is front mounted, all I/O ports, all networking, and even the power to the chassis is on the front panel. This method of running the cable through the box, back out, then back in may seem only slightly more elegant than draping an extension cord across the racks secured with bubble gum but SuperMicro assures us this will be replaced by a switch in very short order. Next up is the similarly aptly named Sys-5038AD-T which as you know from the name is the new SuperMicro workstation barebones. It has a Haswell based S1150 Xeon in it along with the Z87 chipset, three PCIe3 16x slots with 16 lanes shared among them (16/0/0, 8/8/0, or 8/4/4), and a 900W PSU. It has room for two 5.25″ devices, three 3.5″ bays internally, two more externally, and four optional 2.5″ bays too. As a nod to the gamers SuperMicro put in three color LEDs that change with overclocking status and heat, and the system has mounting points for water cooling. 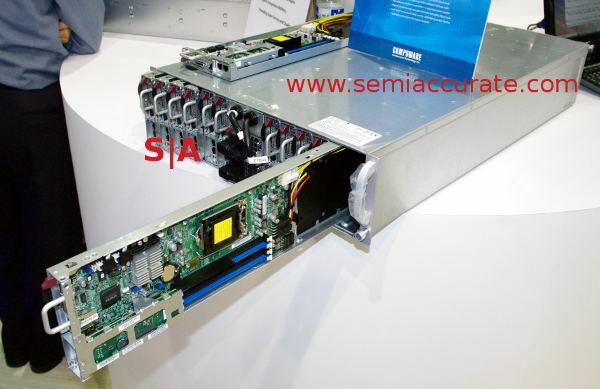 It is built to the SuperMicro server quality standards so it is solid and heavy. Other than the lack of PCIe slots because of the CPU choice it looks pretty good until you notice the Thunderbolt logo. Yup, expensive, pointless, broken and proprietary. Hold off on this one until they change the mobo, it isn’t worth paying the hefty premium for detrimental silicon.